The set of 18 charts make it easy to see how all the numbers compare with previous years. Revenue, for example, is up $2.5B year-on-year after the far greater declines in each of the previous quarters (above). The four-quarter moving average (below) also provides an alternative view of revenue, making it easier to understand the overall trend pattern. 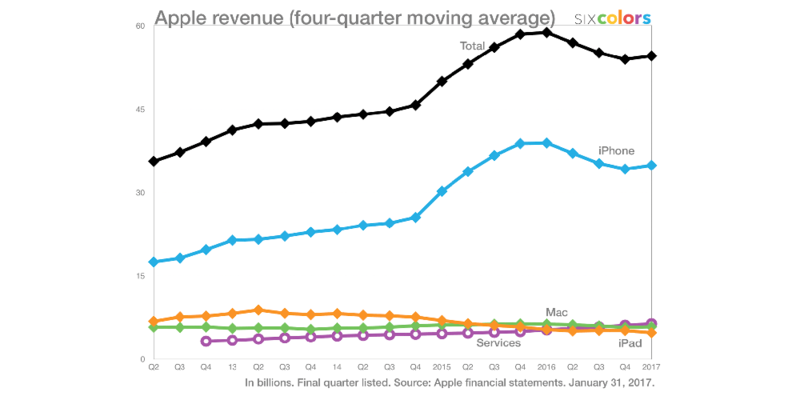 Other charts include profit; sales, revenue and growth for iPhone, iPad and Mac; average selling price across each of the same product lines; and the increasingly important services revenue. In addition to the headline financials, Apple also revealed a few other snippets of information. Apple Pay users tripled in the course of last year, with transaction volumes up 500%. The company also hinted at more original TV content for Apple Music subscribers as the cable bundle was, said Tim Cook, ‘beginning to break down.’ Check out our live blog for more, together with the full set of charts over at Six Colors.